A CHILD leaves the family and goes to something called a school. The child is meeting the world in a new way. Often at that time there is a rift in the mother’s mind and in the child’s mind. A child most often is very important at home; often, too, because his mother has made him into a prince and at the same time he feels disdainful of her because she does not really see him, he has gone within himself. If this going within himself is very steep, he finds school painful. A boy of seven or so, every day at nine o’clock of a school week, would get into a situation we humorously called “visceral civil war.” This situation came from a delicate ethical disturbance. He knew that when he went among the boys in his class, his mother and father would be forgot. He felt in going to school there was a big rift in the life of that day. It is the same as when a person goes to work and, being dissatisfied with home, uses his work to forget the home. A child can sometimes study very hard and want to be at the head of his class in order to forget how things are at home. Most often it takes a contrary form: a child feels that his mother and father are somehow in a conspiracy to send him to school, and he’s not going to be entirely there. The first thing to see about learning is that all learning, if it is honest, means a giving of ourselves to something in such a way that that thing becomes ourselves. If a child learns a new word like door, the spelling of the word door becomes part of him. If he wants to welcome things becoming part of himself, he won’t mind knowing how to spell a word. It happens that teachers are in the same state as the children. On the one hand, they have to appear cognitive, as if the world consisted of knowledge and poise—but on the other, they too have the turbulence of a warfare with the world of everyday. The big thing wrong with teachers is that they are unwilling to teach. I am not using the phrase “unwilling to teach” in any superficial sense. When you teach you want to give something, to which already you have given yourself, and to which you are giving yourself at that time. If this is not occurring the teaching will be mechanical, and the children will feel it and will show their displeasure in one way or another. The problem in education for the child is to think that while he is learning geography, spelling, arithmetic, all this is about himself and is good for himself. The problem that the teacher faces is to feel that as she is presenting her knowledge to these children, sometimes so impudent, so difficult, the presentation of knowledge is good for herself. There has to be a junction of the cognitive and the affective; or, put otherwise, of information and affection. That is hard, because to care for something meets a lot of unconscious opposition. To care for a child, a woman, a man, deeply, means you have to give up something of yourself. The same is true if you care for learning. So there are many persons who capture learning. There was a young lady, a Phi Beta Kappa, who would study ferociously for weeks, get her high marks, and then forget immediately. As we learn things, we unconsciously have an attitude of capturing those things or we really care for them. A good deal of what is called proficient scholarship is capturing, and that is very bad, because once we happen to be Tamburlaines of culture, we are doing the same thing as capturing people. An article in the New York Times [February 6, 1949], has this: “Traditional methods…will have to be modified to produce a friendlier…atmosphere in the classroom, Dr. Clare C. Baldwin…said.” There is a feeling that there has been a class war in Iate years between teachers and children. The children haven’t understood that teachers have problems, were little girls too or little boys, know other people, and sometimes are scared at night too. The teachers have looked on their charges too often as cute but impossible problems. Whenever we like something there is knowledge; we must care for knowledge—love it, in a way, and love the person who stands for it. So Dr. Baldwin in a fashion is correct when he calls for more friendliness. Friendliness, however, is not something that can be had on self-demand. A person can decide for a whole year that he wants to be friendly, but if he does not understand the things in him that make it seem more advisable to be unfriendly, he will continue to be unfriendly. There was a child who sometimes studied hard to get back at his mother. The child felt that he went through baby talk, through some of that hardly endurable cuddly-wuddly stuff at home; and the mother, though she tried to act as if he had grown up, really could never convince him that she felt so—so he would be a man with his studies. He didn’t care for the studies as such; he wanted to show his mother that he was a different person in the school. Sometimes we get revenge on the mother in another way: we decide we won’t know anything. Our minds go elsewhere. We take comic books with us and read them while we are supposed to be studying geography. The first thing necessary is the integration of what we began with—that is, the people around us at birth—and what we are going to. Many mothers don’t want their children to go to school. They feel, “Well, compulsory education exists and, after all, I want my child to be educated. But there is a certain unspoken language that my son and I will have no matter what he Iearns. He can learn functions, he can Iearn perspective, he can learn higher fractions and cube roots—who cares. When he is home, no cube root—just mother and son.” A mother also has the feeling that in school the child is really working for her: it is his way of showing his gratitude and his esteem for her. He is going to learn all those things so that people will say, “How learned Julius is; therefore, what a fine mother Julius has.” Very often a child does feel he is working for his mother or father, and there is a great deal of trouble. A person who felt that, strangely enough, is Henry Adams. 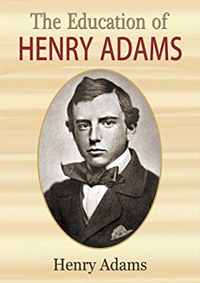 His autobiography, written in the third person, is one of the best known books in American Iiterature, The Education of Henry Adams. He was the grandson of a president, John Quincy Adams. Henry Adams in the 1840s (he was born in 1838) is going to school, and he writes, “Every one…conspired towards an education which he hated. From cradle to grave this problem of running order through chaos, direction through space, discipline through freedom, unity through multiplicity, has always been, and must always be, the task of education.” Adams is expressing the idea of putting opposites together. “But a boy’s will is his life, and he dies when it is broken.” Towards the end of his life, this eminent historian remembers that he was worried about his will or his individuality and he didn’t want any teacher to break it or change it. “Rarely has the boy felt kindly towards his tamers.” Many children think they are going to school to be tamed, not to get freedom or new energy. The war between child and father and mother is carried on in the form of child and teacher. He distinctly remembered standing at the house door one summer morning in a passionate outburst of rebellion against going to school. Naturally his mother was the immediate victim of his rage….He was…holding his own, with sufficient energy, at the bottom of the long staircase which led up to the door of the President’s library, when the door opened, and the old man slowly came down. Putting on his hat, he took the boy’s hand without a word, and walked with him, paralyzed by awe, up the road to the town…, until [Henry] found himself seated inside the school….This act, contrary to the inalienable rights of boys,…ought to have made him dislike his grandfather for life. He could not recall that it had this effect even for a moment…. [His grandfather] had shown no temper….During their long walk he had said nothing; he had uttered no syllable of revolting cant about the duty of obedience. The chief objection that a child has to a mother and father when on Mount Sinai handing down the law, robed in clouds of parenthood, is that he doesn’t believe they believe it. It doesn’t sound sincere. He doesn’t think the teacher is sincere either: he’s just an instrument; he’s saying all these noble things, but he has to say them, and somewhere he knows better too. Consequently, if anybody begins quoting the Decalogue and a lot of virtuous voluminosity in order to persuade a child, and he feels this guy or this lady doesn’t mean it—well, he won’t obey if he can get away with it. Here, silence seems to be more sincere, so Henry Adams goes along with his grandfather, John Quincy Adams.